The bedroom is your area of rest after long day. 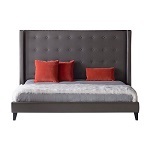 Scandinavia, Inc. modern/contemporary beds are the highlight of any well-designed modern bedroom. We present bedroom furniture from around the world in different sizes, innovative design, and even different shapes. Round beds, platform beds, leather beds, upholstered beds, high gloss beds, dark wood and light wood beds, and teak wood beds Scandinavia, Inc. offers options of modern and contemporary style. Create your New Bedroom today!